Streamline your admin with cashless payment through licence plate recognition - and it’s all free! 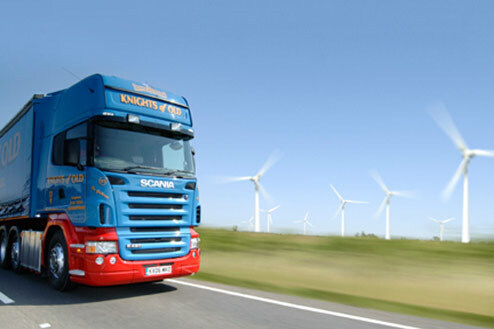 SNAP is a national payment account for HGVs. Simply register your vehicles online and anytime they use a SNAP approved HGV service, such as lorry parking or truck washing, we’ll add the cost to your weekly invoice. Simple and transparent expenses. Recognising your fleet’s registration numbers, SNAP removes the need for drivers to carry cash or keep track of receipts, as well as offering operators dynamic control over which vehicles are allowed to use various services. The driver simply turns up at a HGV parking site or truck wash and supplies their registration, or drives through the Dartford Crossing ANPR system and this allows the fleet operator to be automatically billed for the services used. 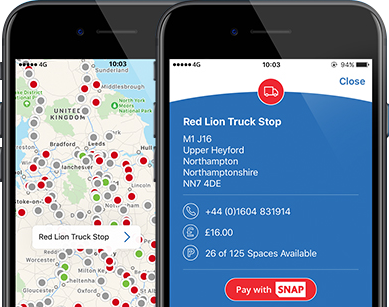 SNAP Account offers easy cashless payment at over 130 HGV parking sites across the UK, plus exclusive access to pre-bookable lorry parking at SNAP-only depot sites; these are normally other fleet operator’s yards and provide high levels of security as well as guaranteeing that your drivers have a space reserved when they arrive. We offer easy cashless payment at over 60 HGV washing sites across the UK, plus optional wash frequency control, making the management of your fleet’s truck washing expenditure a breeze. Coming soon to our partner app intruck, you will be able to complete your daily checks from any Android or iOS device. It allows load, damage, incident and crime reporting with picture uploads. It will be free for SNAP Account members for the first 6 months and just 50p per vehicle per week afterwards. We work with a large number of HGV service providers across the country that support our cashless service, so when your registered vehicles use any of our partner services, we will be sent a notification detailing which service was used and by which vehicle, then we’ll send you an itemised invoice at the end of the week. Simple! You can manage your fleet easily using our online portal, adding or removing registered vehicles whenever the need arises. You can also control which services are used by each vehicle, and how often. SNAP Account is very useful for myself and another part time drivers as it nullifies the need for carrying cash plus the fact that all transactions are recorded on invoice. We use SNAP in the main for overnight parking and find the network of sites comprehensive and well placed.